Nearly 50 percent of patients with deep venous thrombosis (DVT) develop post-thrombotic syndrome (PTS).1,2 The signs and symptoms of PTS are gradual in onset and have a progressive course.3,4 Most patients can be managed with leg elevation, exercise training and compression therapy so that their quality of life is improved sufficiently.5 The incidence and severity of PTS depends on a number factors. Location and extent of the venous obstruction (iliofemoral > femoropopliteal > crural) are the most relevant aspects.6 Currently, endovascular techniques to manage post-thrombotic disease in the iliac-common femoral veins are routinely performed (angioplasty/stent placement) with good results. Figure 1. 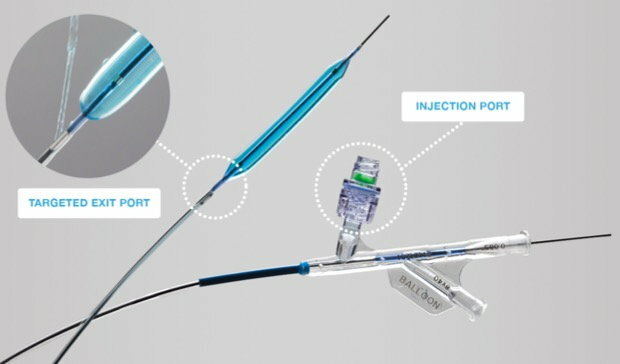 High-pressure PTA balloon with a dedicated injection port that allows infusion of medications/contrast through a proximal (to the balloon) exit port. The procedure is offered to patients with post-thrombotic FPV obstruction with advanced CVI (clinical class C4-C6) who have not responded to conservative measures (compression therapy, leg elevation, exercise training, weight control, and skin care), nor to previous venous interventions (iliac venoplasty stenting and/or superficial venous disease treatment). Patients with high VCSS scores and significant symptoms that cause substantial disability may benefit the most. Patients are clinically-evaluated and a comprehensive venous duplex ultrasound is performed. The anatomy and function of the deep and superficial veins in the affected limb are interrogated by B-mode, color Doppler and spectral waveform images. The ultrasound assesses the deep veins for location, extent, severity of the obstruction in the FPV, the inflow (popliteal, tibial, peroneal) and outflow (common femoral, iliac, inferior vena cava) veins. Pathological valvular incompetence is evaluated, along with presence and distribution of collateral pathways. Axial imaging and/or venography with intravenous ultrasound (IVUS) is an option for evaluating outflow obstruction. The presence of disease in the superficial veins and/or venous outflow needs to be addressed first. Patients who have no superficial and/or outflow venous disease, or those in whom such disease has been addressed yet have persistent advanced clinical signs and symptoms, may be offered FPV obstruction treatment. Anticoagulation with low-molecular-weight heparin (LMWH) needs to be initiated one week prior to the intervention and continued for at least six weeks post-intervention. Conversion to oral anticoagulation for three to six months is recommended and in selected patients, lifelong therapy as clinically-indicated. If patients were on anticoagulation medication prior to intervention, they are restarted on their previous regimen after LMWH use for six weeks. The procedure can be performed in a hospital on an outpatient basis or in an office-based lab using local anesthesia and moderate intravenous sedation. Patients are asked to fast for eight hours. No antibiotic prophylaxis is used. The patient is placed on the fluoroscopy table in the supine position. The entire lower extremity is prepped from the groin to the foot. Using ultrasound, the posterior tibial vein is accessed with a 4-Fr micropuncture kit. Access to the popliteal vein, in the prone position, can occasionally be used in patients with minimal tibial disease. The location and extent of the obstruction, collateral pathways and the outflow vessels are assessed by ascending venography (Figure 2). Figure 2. Pre-intervention venogram indicating significant femoral vein obstruction with multiple collaterals. The obstruction is traversed with a 0.035 Glidewire® (Terumo Medical, Tokyo, Japan), and a 6-Fr sheath is inserted. Difficulty in crossing the obstruction can be overcome by using a CTO crossing catheter or the TriForce® Peripheral Crossing Set (Cook Medical, Bloomington, Indiana). Once the obstruction is crossed, unfractioned heparin (4000-6000 units) is administered as bolus intravenously, and an infusion is started at 500 units/hour through the access sheath. The Chameleon catheter is inserted and the tip positioned at the level of the common femoral vein or the most proximal obstruction-free venous segment. The unique features of this balloon include the proximal infusion port, which allows infusion of medications/contrast during ballooning and that it is a high-pressure balloon, which is required for fibrotic post-thrombotic venous lesions. Venoplasty is performed with sequential balloon inflation from cephalad-to-caudal. Concurrent infusion of a solution containing thrombolytics (t-PA) begins while venoplasty is being performed through the balloon catheter. Eight milligrams of t-PA (six milligrams for the femoral-popliteal segment and two milligrams for the tibial segment) is dissolved in 25 milliliters of contrast and 25 milliliters of normal saline solution. The mixture of the thrombolytics with the contrast allows direct visualization of the distribution of t-PA into the diseases vessel without systemic circulation. Three milliliters of the mixture are slowly injected through the infusion port during each balloon inflation (Figure 3). Figure 3. PTA of FPV with the Chameleon balloon (white arrow) and injection of t-PA/contrast via proximal infusion port (orange arrow). This allows prepping of the vessel and retrograde visualization of the distribution of t-PA into the diseases vessel minimizing systemic circulation. 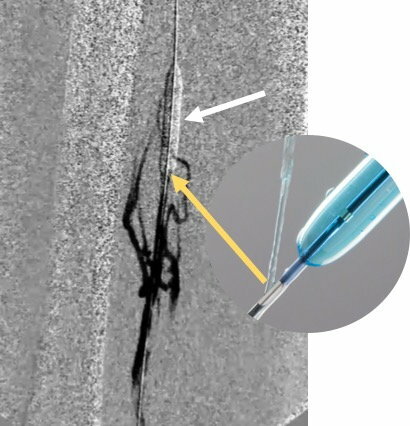 The reason behind prepping the vessel with t-PA along with systemic anticoagulation is to prevent vessel thrombosis from aggressive balloon angioplasty, which may lead to acute thrombosis in addition to the chronic disease already present. 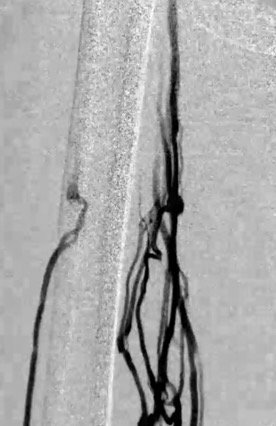 The balloon is kept inflated for 30 seconds at each treated vein segment. Sequential dilatation is performed until a maximum vein diameters of eight to10 millimeters in the femoral vein, six millimeters in the popliteal vein, and four millimeters in the tibial vein is achieved. During venoplasty, there are often areas of significant balloon waisting which require a high-pressure balloon. Treating such a segment requires an aggressive approach. Completion venogram is obtained, looking for improved venous flow and reduction in filling of collaterals (Figure 4). Sometimes there is no dramatic change when comparing the pre- and post-venogram images, which may be due to the elastic recoil of the fibrotic vessel. Re-ballooning these areas may not show any additional benefit, especially if there is no residual balloon waist. The access sheath is removed and routine pressure is held at the access site to avoid complications. Figure 4. 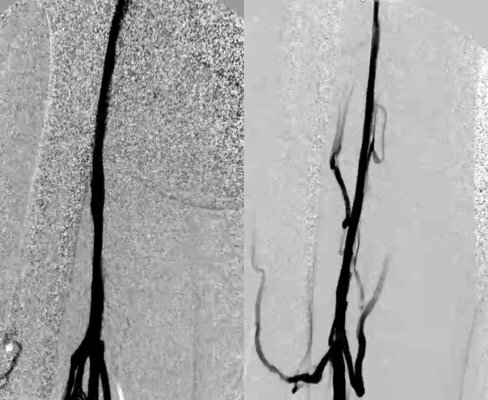 Post-intervention venogram reveals improved venous flow and reduction in filling of collaterals. The patient is started immediately on LMWH, and a sequential compression device is employed until the patient ambulates within one to two hours of completion of the procedure and is discharged. Elastic compression stockings (20-30mmHg) are used, and routine anticoagulation protocol. Clinical and ultrasound follow-up appointments are scheduled at one-week, one, three, six and 12 months. Single-session venoplasty with local t-PA infusion can be performed in the outpatient setting and potentially reduce the signs and symptoms of PTS. Initial short-term results in our experience appear to parallel the overnight multi-session treatment protocol of the ACCESS PTS Trial. We need longer and larger longitudinal studies to demonstrate the effects of this technique. A disease state that traditionally has been thought of as untreatable may finally have endovascular options. Infrainguinal chronic deep venous disease is one of the last challenges we need to overcome for our patients. Kahn SR, Ginsberg, J.S. Relationship between deep venous thrombosis and the post thrombotic syndrome. Arch Intern Med. 2004 Jan 12;64(1):17-26. Sharifi M, Mehdipour M, Bay C, Smith G, Sharifi J. Endovenous therapy for deep venous thrombosis: the TORPEDO trial. Catheter Cardiovasc Interv. 2010 Sep 1;76(3):316-25. Labropoulos N, Gasparis AP, Pefanis D, Leon LR Jr, Tassiopoulos AK. Secondary chronic venous disease progresses faster than primary. J Vasc Surg. 2009 Mar;49(3):704-10. Kahn SR, Shbaklo H, Lamping DL, Holcroft CA, Shrier I, Miron MJ, et al. Determinants of health-related quality of life during the 2 years following deep vein thrombosis. J Thromb Haemost. 2008 Jul;6(7):1105-12. Kahn SR, Galanaud JP, Vedantham S, Ginsberg JS. Guidance for the prevention and treatment of the post-thrombotic syndrome. J Thromb Thrombolysis. 2016 Jan;41(1):144-53. Labropoulos N, Waggoner T, Sammis W, Samali S, Pappas PJ. The effect of venous thrombus location and extent on the development of post-thrombotic signs and symptoms. J Vasc Surg. 2008 Aug;48(2):407-12. Klein SJ, Gasparis AP, Virvilis D, Ferretti JA, Labropoulos N. Prospective determination of candidates for thrombolysis in patients with acute proximal deep vein thrombosis. J Vasc Surg. 2010 Apr;51(4):908-12. Garcia M, Sterling K, Jaff M, Ouriel K, Kahn SR, Comerota A. Treatment of chronic deep vein thrombosis (DVT) and post-thrombotic syndrome (PTS) with the EkoSonic endovascular system (ACCESS PTS). Presented at the Society for Vascular Medicine (SVM) meeting. New Orleans, LA, June 2017.